This afternoon snowflakes started to cover the ground. 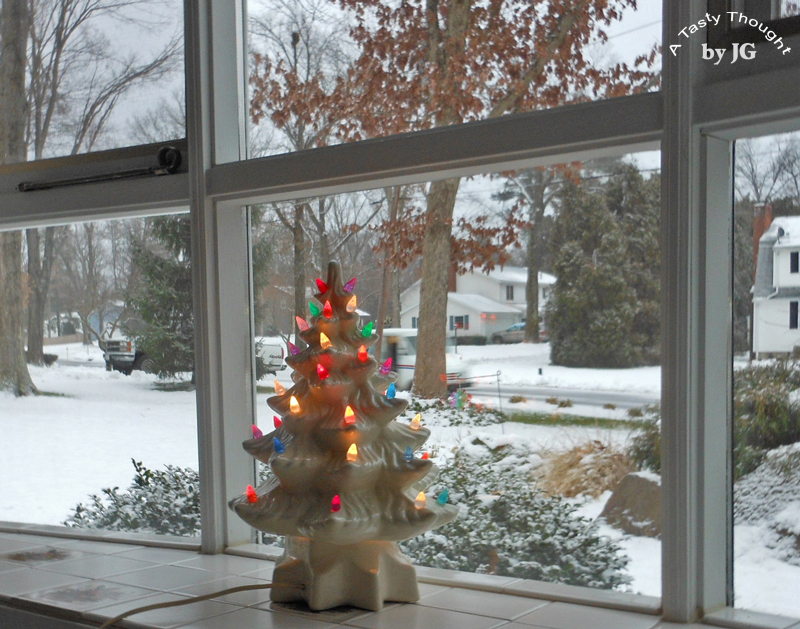 I always enjoy the view from our window - during each of the four seasons here in New England. The appearance changes, but that also allows time to plan for the next seasons. Right now, our snow blower is ready, so we are good to go! I like to try to plan ahead. I like to try make things easy, whenever possible, if possible. With all of the FuN activities going on this weekend and early next week, the dilemma of a great Christmas morning breakfast needed an answer. A food that we all enjoy and is also hearty. A food that also can be prepped easily on a very busy morning. Well... I only needed to check out my own blog to find the answer quickly. In the top right hand corner of my header is a plate containing a large amount of Blueberry Buttermilk Pancakes. I remember the day I snapped the pic before I packaged and placed the delicious light pancakes in the freezer. If I took a vote in my fam, this would be their fave breakfast. These pancakes freeze very well and also taste so yummy after reheating in the microwave. A package of Blueberries was defrosted in the fridge overnight. A fresh quart of low fat Buttermilk was purchased yesterday. King Arthur White Bread Flour is now my flour of choice when making these. 1 Egg + Egg Whites, Olive Oil for sauteing & baking + 1% Milk. Add in a little Cinnamon and a little Nutmeg! This is definitely my kind of recipe, because I've lowered the cholesterol content! 2 Egg Whites = 1 Whole Egg when cooking. Needless to say, after I prepped a batch this morning my DH & I enjoyed them. After the remaining Blueberry Buttermilk Pancakes cooled slightly, each pancake was placed in a sandwich bag. Little stacks were then placed in Ziploc Freezer Bags, labelled and then found their place in our freezer. These Blueberry Pancakes with Buttermilk are so good! Lightly beat Egg + 4 Egg Whites in another bowl. Add Buttermilk, Milk and Olive Oil. Beat. Pour wet mixture into dry mixture in large bowl. Stir just until blended. Make sure all dry ingredients are mixed in, but do not over stir. Allow about 1/3 Cup of batter for each pancake and place on griddle. 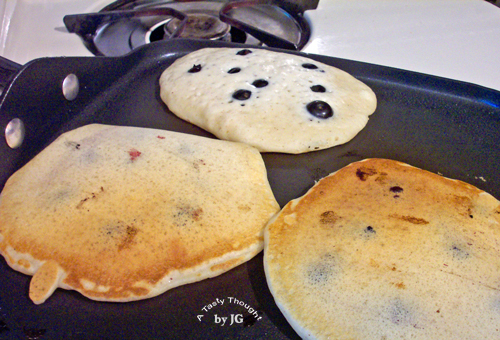 Add 8-9 Blueberries to each pancake. When brown on one side flip over. This will be a great surprise for my fam this weekend! Do you use Olive Oil for sauteing & baking? Do you cook using Egg Whites? 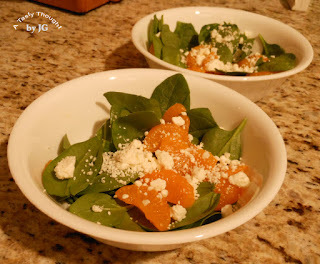 We totally enjoy Mandarin Orange Spinach Salad, so fresh Spinach is on my weekly grocery list. It's a great change from tossed salads during the colder months - when our grocery stores in the northeast do not always offer tantalizing fresh produce. The other day no containers of Mandarin Oranges were to be found in my pantry. That was a surprise! 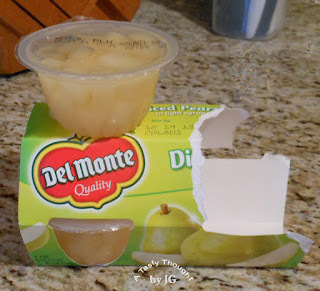 However, a Del Monte 4 pack of Diced Pears in Light Syrup was waiting in the wings! Why not try it? Try it we did! 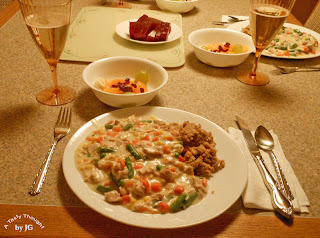 An individual serving of fragrant Diced Pears was opened to prep the two dinner salads. Pears over Baby Spinach Leaves with a bit of Feta Cheese and a drizzle of Balsamic Vinaigrette. YuM! This is another delicious salad! Did I mention easy? What can be easier than snapping off the long stems from the fresh Spinach leaves and placing them in a salad bowl? Add a few Diced Pears and top with a bit of Feta Cheese. Drizzle on the desired amount of Balsamic Vinaigrette. That's what I call easy! *Yes, I do snap off the long Spinach stems. Sometimes even with Baby Spinach Leaves, the stems can be a bit tough to chew. Not good. 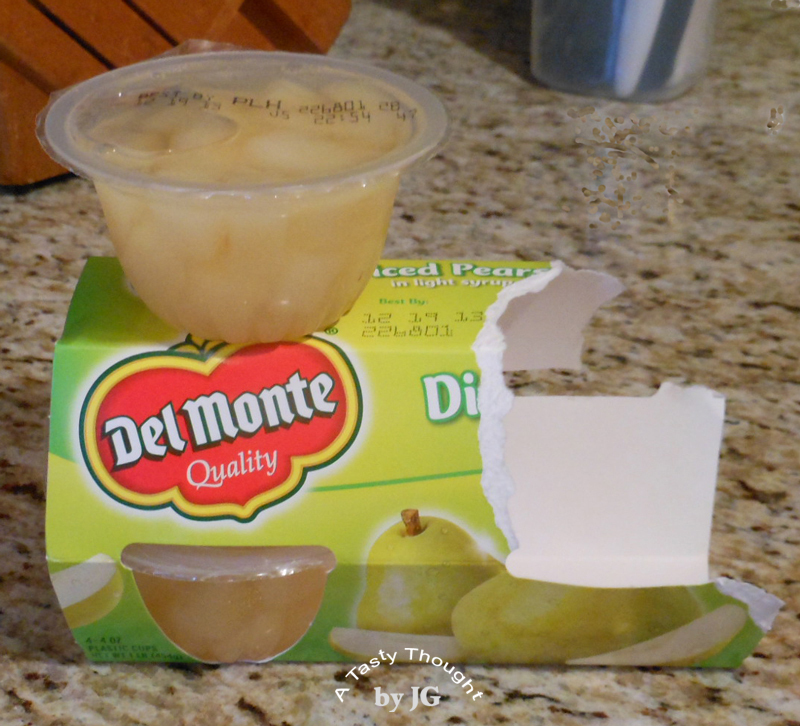 My local grocery store, Big Y, is offering a special on these individual serving 4-packs of Del Monte Diced Pears. I'll be sure to check that out, again! 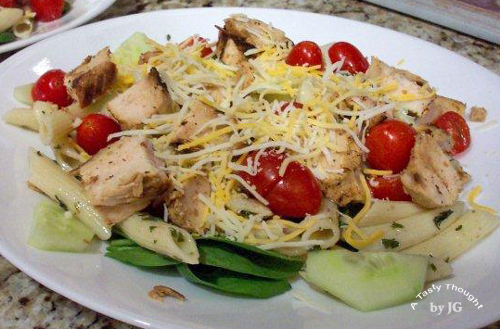 Chunks of fresh, ripened Pears would also be delicious in this salad! Sour Cream Sugar Cookies, Yummy! Biting into a homemade soft sugar cookie that has just a hint of nutmeg is my choice for a sugar cookie! Sour Cream Sugar Cookies are hands down...the winner. Rolled out and cut into festive shapes, then decorated with colored sugars, they are perfect for the holidays...any holiday. This past week I started my Christmas baking! There are always unexpected happenings and also sewing projects to complete, but I always have time to bake these delicious cookies containing sour cream. It is a two step process. On Day 1 the dough is made, wrapped and then stored in the fridge overnight. On Day 2 my cookie cutters, decorated sugars, rolling pin & rolling mat are used. Rolling out the dough that has been refrigerated, overnight. For years I've been baking this soft cut-out cookie and it has become a tradition for my fam to enjoy them at Christmas. An added + is that after they are baked and cooled, these cookies can be packaged and stored in the freezer until the holiday arrives. Now, a double batch of these scrumptious family faves, are ready and waiting in our freezer. ***Unsalted Butter works best in this recipe! The stiff dough is easier to work with. 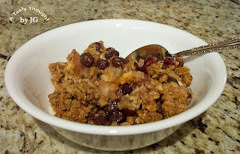 In large bowl with electric mixer beat Butter and Sugar until light and fluffy. Add in Baking Powder, Baking Soda, Salt and Nutmeg. While beating on Low, slowly add Flour, 1 Cup at a time. Add in Vanilla and Sour Cream. Beat on Medium until well combined. Dough will be stiff. Remove dough from bowl and place on plastic wrap, wrap dough. 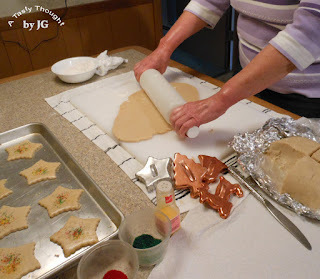 Place wrapped dough on aluminum foil and wrap well. 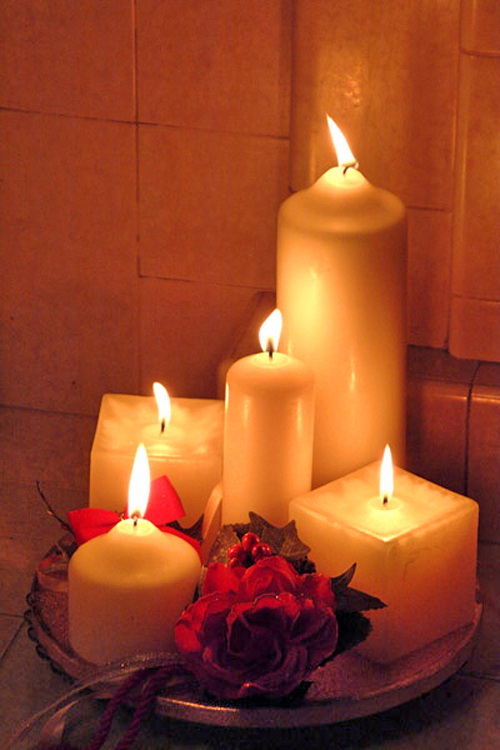 Unwrap dough and cut into four parts. On well floured surface, roll dough to 1/4" thickness. 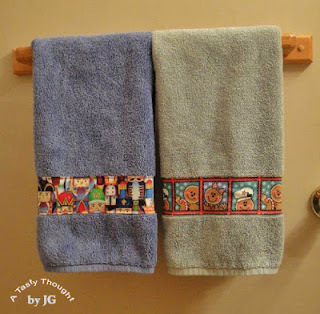 Use cookie cutters. Bake 10 - 11 Minutes. Bottom of cookies will be a light golden brown. Remove with spatula to wire cooling racks. When cool store in airtight containers. **These cookies also freeze very well. 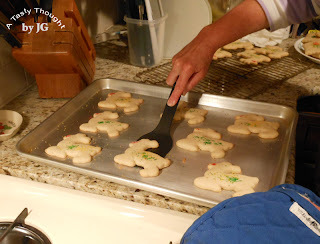 If you want to treat your family and friends to a sugar cookie that is light and contains a hint of Nutmeg, take out your cookie pans/sheets and the cooling racks! These Sour Cream Sugar Cookies are just the best! 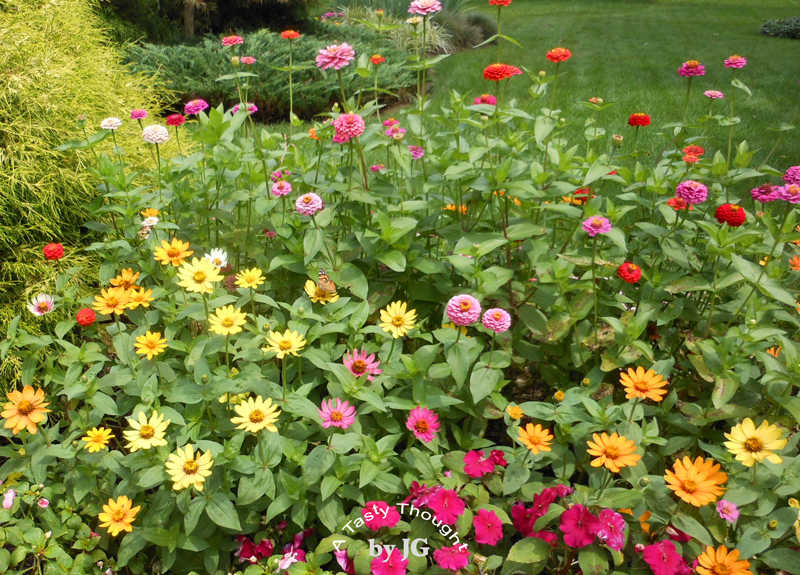 The elevated perennial garden in our backyard changes in appearance every season. This afternoon was so comfortable with temps in the 50°'s. We were heading out shopping and I took a quick glance outside from our Family Room. Then, another longer look. 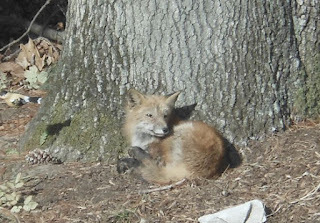 A fox was basking in the sun under our large tree looking very relaxed. That was a surprise! The fox was comfortable enough to give me time to get my camera for a photo op. Definitely, I took the pic from inside! 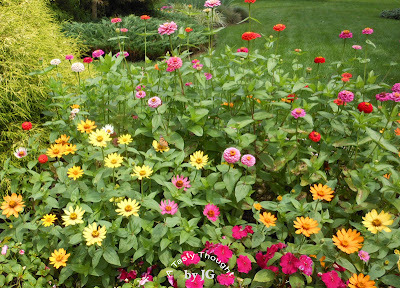 :) I'm accustomed to deer, squirrels, skunks, chipmunks, rabbits and even a fisher cat once, moving through our yard. Today brought a surprise. A fox getting the rays! That fox sure was enjoying the sun! Grilled Cheese...yum! The sandwich containing oozing warm melted cheese has been a fave of mine for years. Usually, lunch for me is Yogurt over a sliced Banana along with a glass of Orange Juice. Bananas are not a fave with me, so I hide them in other foods, whenever possible, to eat the fruit daily. Yesterday, as my DH & I were delivering "Meals on Wheels" to senior residents in town, the vision of the ripened Avocado sitting on my kitchen counter kept popping into my thoughts. Suddenly, I knew how the green fruit would be enjoyed! 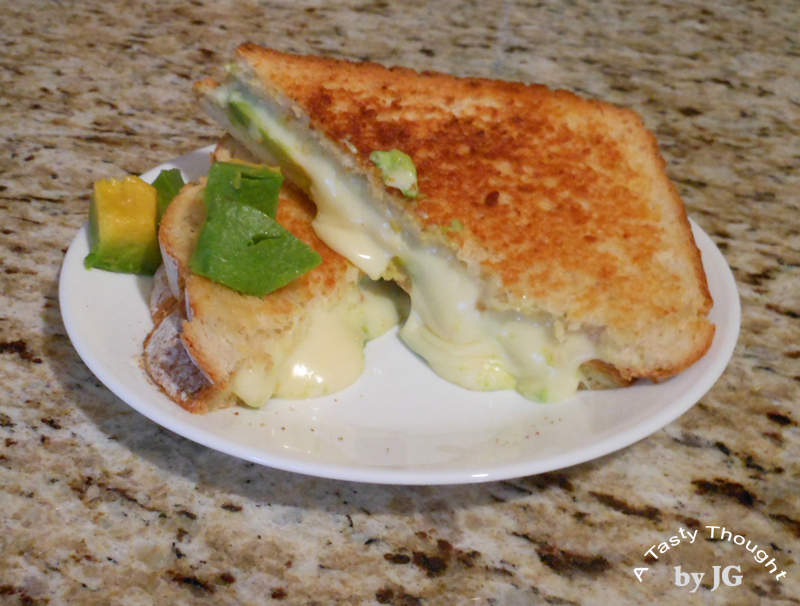 A Grilled Cheese & Avocado Sandwich! I envisioned cheese topped with slices of green Avocado surrounded by Oatmeal Bread. 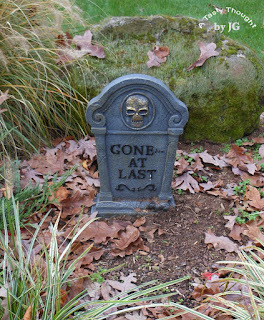 Driving up our driveway, we were famished! It did not take long to defrost 4 slices of Oatmeal Bread and locate my griddle. Good ole' plain Grilled Cheese, Grilled Cheese & Tomato, Grilled Cheese & Ham and Grilled Cheese & Tuna all taste great. This change up using slices of Avocado is also yummy! There was an extra large slice of Avocado remaining. Cut into chunks it made for a very tasty garnish! Do you have small pieces of roasted Turkey remaining in your fridge? Enough to equal about 1 cup? A package/box of frozen peas & carrots or mixed veggies in the freezer? A partial loaf of bread? Family members who are starved at dinner time? If so, it's time for Turkey a la King! After dining on Roasted Turkey with all of the trimmings on Thanksgiving Day and then Hot Turkey Sandwiches tonight, I always enjoy making this particular Turkey dinner for the third Turkey meal! This past Tuesday was "my pie making day", so, no, I'm not about to roll out more dough for Turkey Pot Pies! Turkey a la King is much easier and quicker to prepare. It's also a delicious entree that even contains the veggies! Thanksgiving Day was great! We enjoyed dinner, we chatted it up, we read stories and we also had Duplo construction going on. 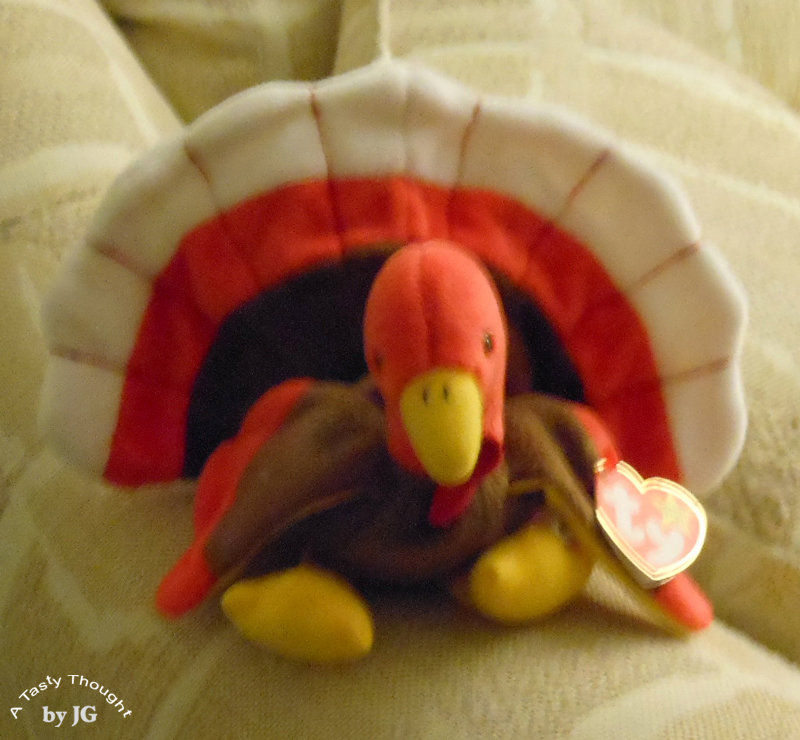 "Gobbles" got exercise, too. Now it's time to c-h-i-l-l! If I have a large amount of Roasted Turkey to use, sometimes I'll make a double batch and freeze half of the prepared Turkey a la King. This makes for another quick delicious dinner after a busy day. During the year, Chicken can be used rather than Turkey. And yes, there is more Cranberry Sauce! 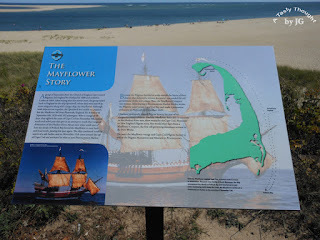 The Cape...Cape Cod in MA... is a wonderful place to visit, especially during the warmer months. 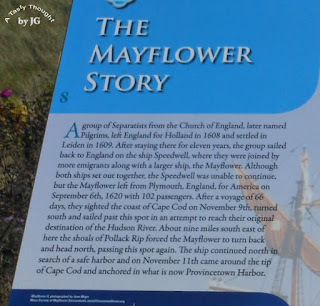 In the small towns a bit of History can always be learned! In the town of Chatham, the Chatham Lighthouse is definitely a "must stop and see again" whenever we are at the Cape. 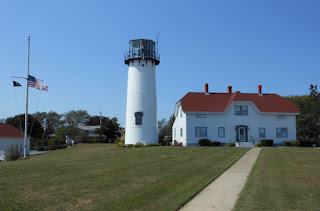 The Lighthouse overlooks Chatham Bar and is now a home to a Coast Guard Small Boat Station. 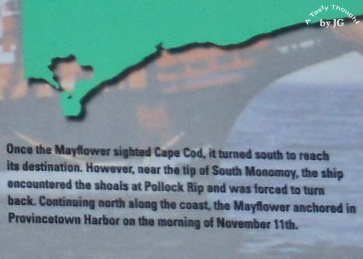 The Coast Guard Station aids boaters and fishing boats whenever emergencies arise. There is a wonderful bit of History to learn while enjoying the salty air in this scenic area. What better time to share it with you than now, during Thanksgiving? 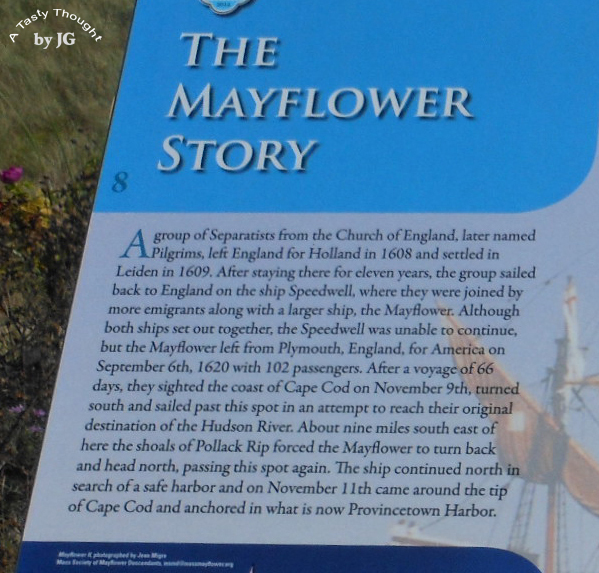 I've posted a photo of the plaque I enjoy reading at this area. 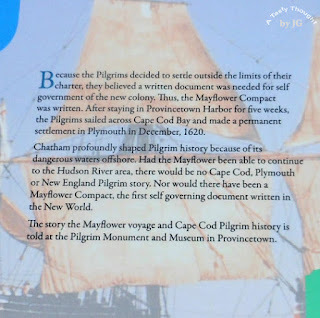 I've also posted the individual sections. 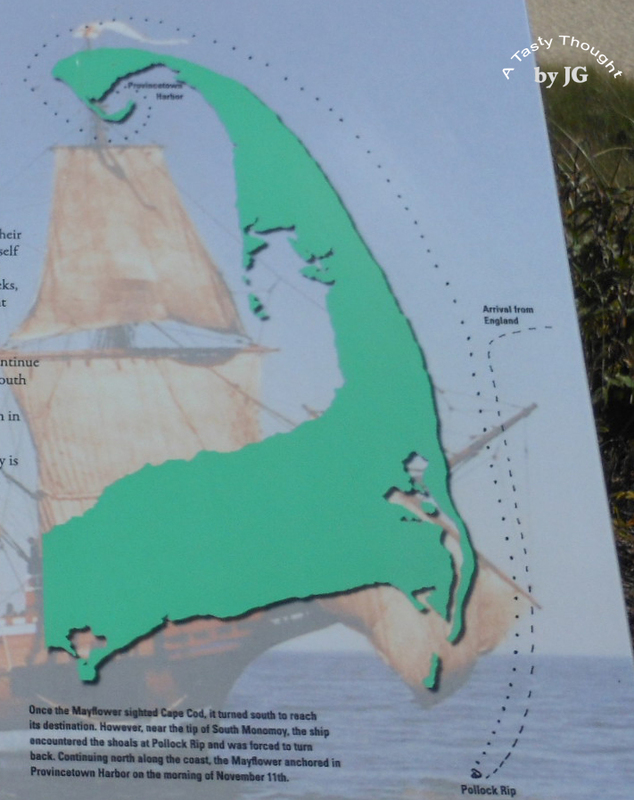 Click on each individual section and the story of the Pilgrims journey to the New World is easy to read. Learning while having FuN is the best way to learn! Thanksgiving Day is approaching! My fresh turkey has been ordered and my oven has come in handy this past week. Apple Bread, Butternut Squash Bread and Cranberry Bread will be enjoyed during the upcoming long weekend. Yum! 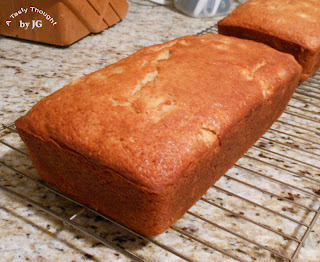 The first two quick breads have already been baked and are in my freezer. The Cranberry Bread tastes best when baked 1 - 2 days before eating. It does not freeze well. Apple Bread is definitely a fam fave! Small pieces of Apples combined with Orange Juice, Cinnamon & Nutmeg result in a very tasty quick bread! Olive Oil for sauteing & baking is also a prime ingredient. 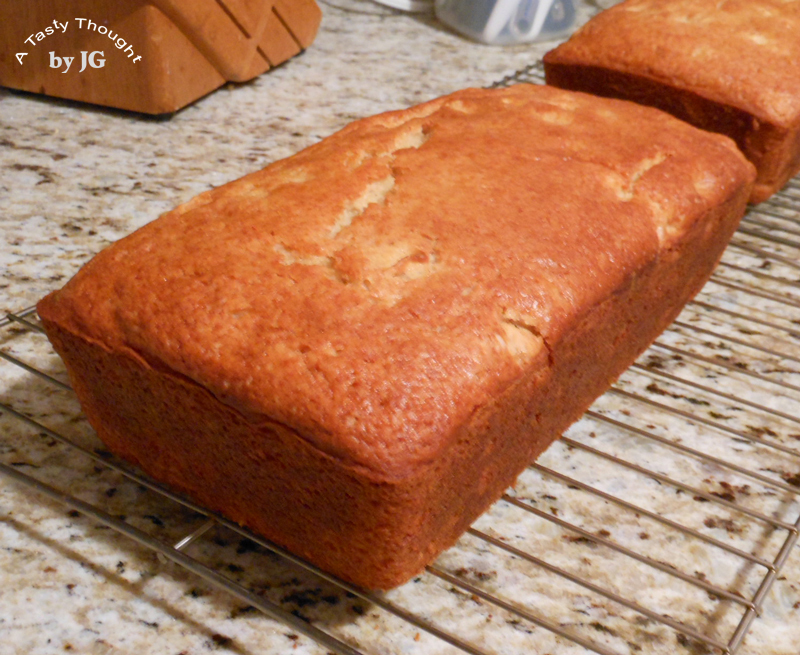 As with all quick breads that I bake, I bake 2 - one to enjoy now and the other is cooled/labelled/placed in my freezer. A few years ago I made a recipe card for this Apple Bread. Click here for recipe. When preparing the batter, I use 4 Egg Whites. It's that cholesterol thing. 2 Egg Whites = 1 Whole Egg while baking. However, if you prefer to use Whole Eggs, use 2 Whole Eggs. 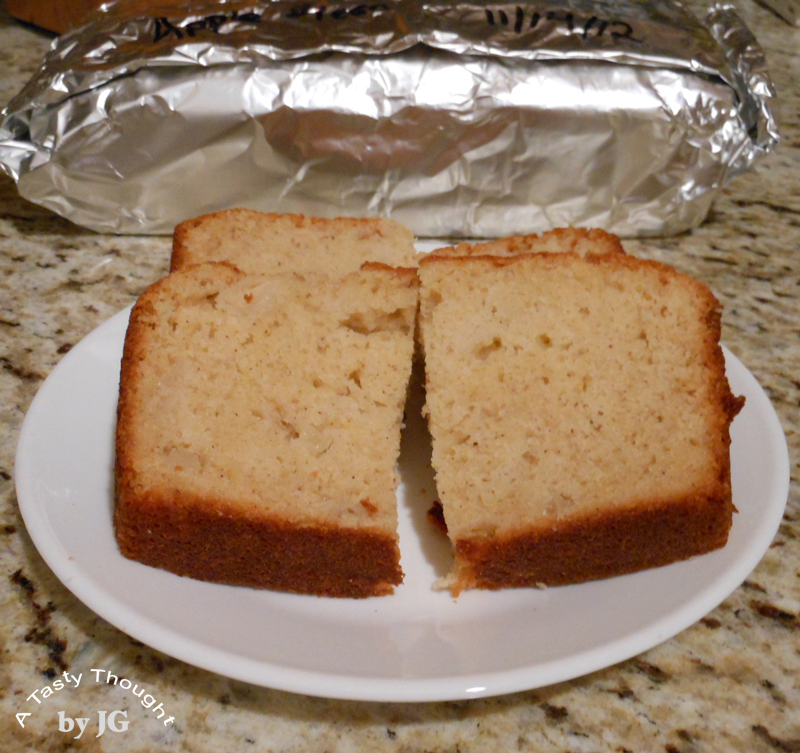 This quick bread is absolutely delicious! There is time to bake this Cinnamon & Nutmeg flavored, moisty, Apple Bread to share with your family/friends on Thanksgiving Day! Who knew that purchasing the 1 and 1/2 pound package of boneless skinless chicken breasts would result in...not 1, not 2, but 3 delicious dinners??? It sure wasn't me! Every so often - when the weather takes a drastic change with the thermometer reading much lower, I seem to try to cling onto the warmer weather. It was chilly outside and Grilled Chicken Medley was my plan for dinner the next evening. The chicken needs to be placed in a Soy Sauce/ Lime Juice/ Cumin/ Paprika marinade for a few hours before grilling. I use my handy dandy George Foreman Grill. 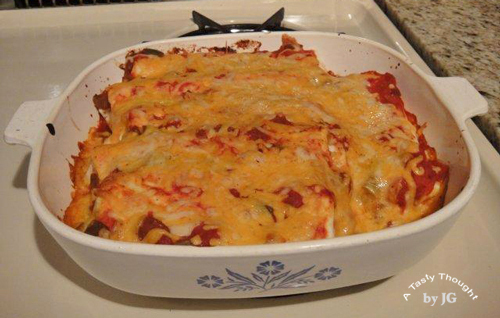 There's always leftover grilled chicken, so the following evening we usually enjoy Chicken Enchiladas. And that we did! Yum! After these two scrumptious meals there still remained about 1/2 cup of grilled chicken. Sweet! Maybe another dinner? Oh, yes! A couple of months ago I saw a recipe in dash - a supplement section to our daily newspaper and saved the recipe to try someday. The recipe was for a Calzone, using a tube of refrigerated pizza dough. My DH & I do enjoy Bertucci's Chicken Calzone, so this was really worth a try! A tube of Pillsbury Classic Pizza Crust located in the Dairy Dept. in my grocery store was purchased. The tasty filling Calzone containing Ricotta Cheese, Mozzarella, cooked Chicken, Oregano, Basil and 2 slices of deli Ham cut in small pieces was absolutely yummy! I'll definitely be making this again! It was very easy! I see Turkey on my horizon. 1 tube Refrigerated Pizza Dough - I used Pillsbury Classic Pizza Crust. Line cookie pan with Heavy Duty Aluminum Foil. Spray Aluminum Foil with PAM. Open tube of pizza dough and place on foil. Combine ALL remaining ingredients in bowl. Using only half of the pizza dough, place filling on dough. 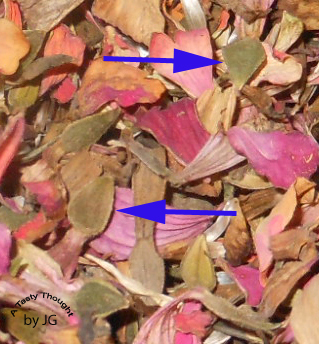 Leave 1" border on edges. Fold other half of dough over filling to edges. Roll edges up and press to seal. Bake in oven for 18 Minutes. Calzone will be browned and puffy. Cool slightly before eating. The cheese is hot. 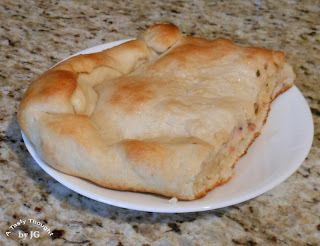 This Chicken & Ham Calzone was delicious! Served along with Mandarin Orange Spinach Salad, dinner was easy to prep and so yummy! Sometimes, do you have a small amount of cooked Chicken? Every week my glass pitcher containing cold water and 3 Decaffeinated Green Tea bags is placed on the window sill. 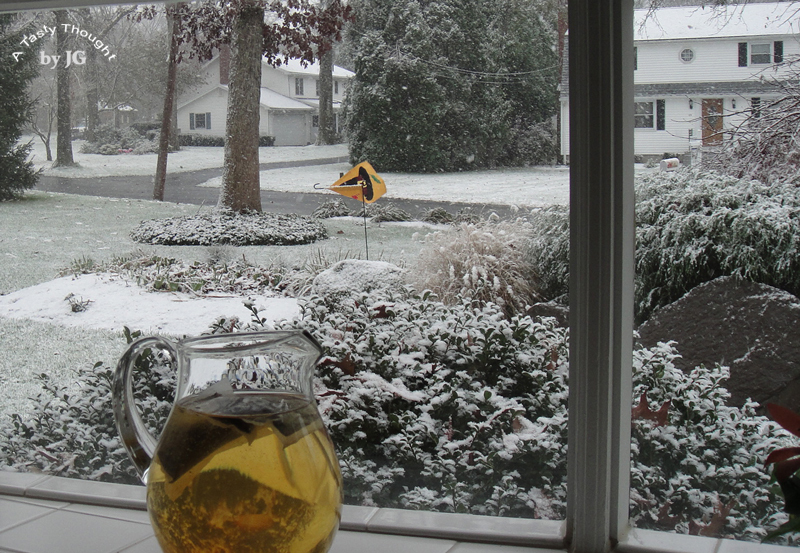 Usually, the sun is shining when I use this self brewing method of preparing Green Tea. This is my "go to" method of brewing a pitcher. WoW! 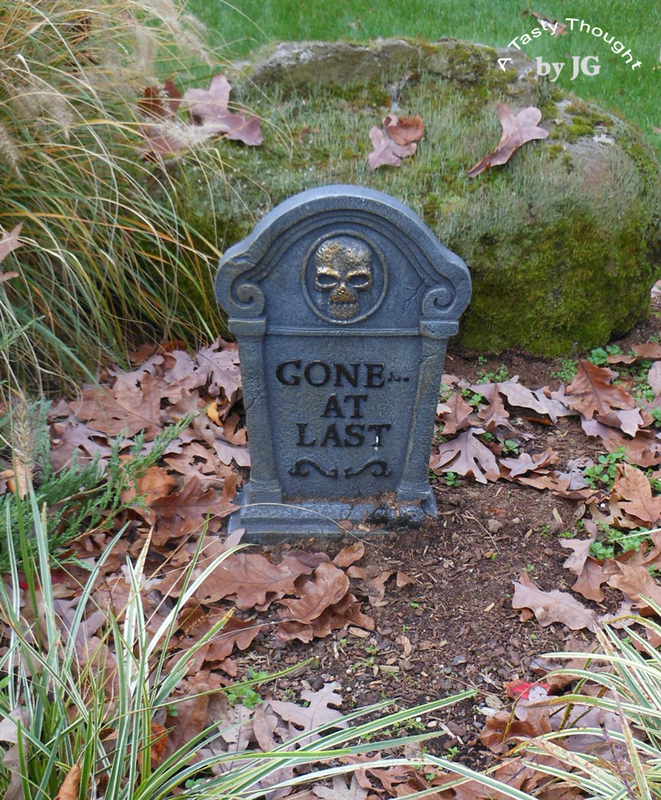 Today, November 7, 2012 - was quite different! Today snowflakes were falling! This day in November sure looks like a December day! 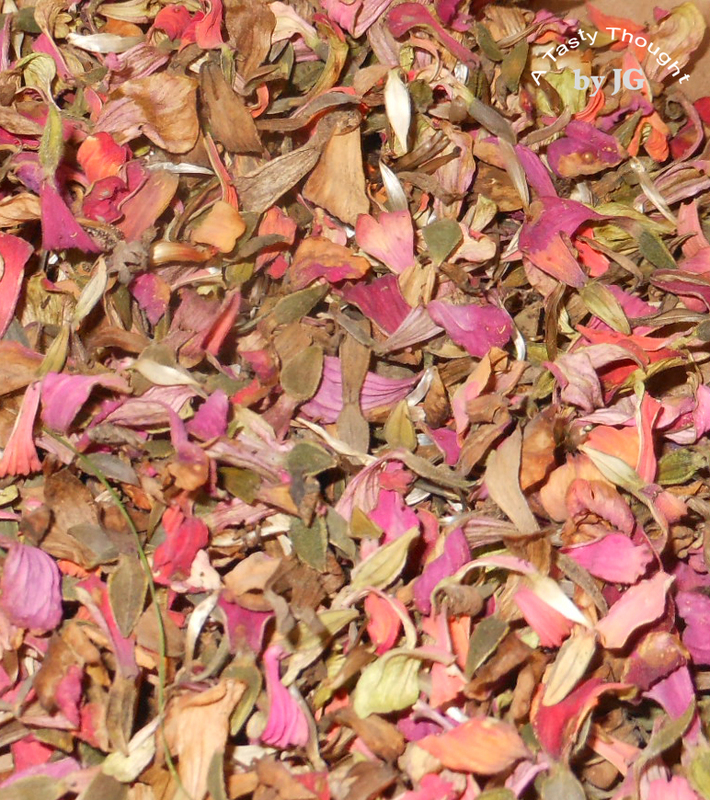 Good thing that the leaves have been collected, the Zinnia seeds stored and the winter hats & gloves are ready to be worn!